There are many ways to get high in the NCR, but Vibe: The Sky Bar at Hilton Garden Inn in Gurgaon is arguably one of the trendiest new watering holes in town. The newly opened alfresco bar, all 10 floors up, fuses some original signature cocktails and finger foods with an enchanting and reposeful rooftop-poolside view. The decor may not be entirely gratifying—the artificial grass grates—but the seclu­ded and artful cabanas offer a modicum of treasured privacy. Our evening started with the Bubble Gum Cocktail (bubblegum-flavoured vodka, sweet-and-sour mix, egg white), which proved itself worthy of its reputation. The fruity flavour tingled the palate most agreeably. We graduated to Wood Pepper, a wood-smoked cocktail with tequila, red wine, red bell pepper, mint, ginger syrup, fresh lime juice, sprite and topped up with a float of red wine. The woody aroma was heavenly, but against the well-meant advice of our minders, we stirred our drink, rather than savour it in layers, and found it rather heady. The Achari Mojito (white rum, lemon mint, sugar, achar, club soda, spiked with a spray of mint) was a bit of a let-down: it was too much like aam panna, not sufficiently infused with the achar influence. But we wound down with a whisky sour, which more than compensa­ted with its mature smoothness. As accompaniments, we sampled some more fusion: blue cheese malai tikka with tom­ato, olive and berry salsa, crispy prawns tossed with curry leaves, and feta cheese-stuffed beetroot patties with sweet and spicy mango chutney, all of which were middling good. 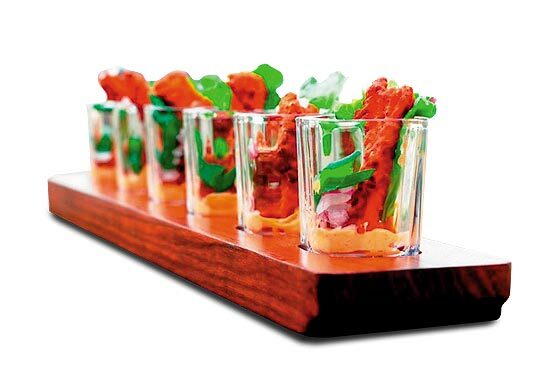 What stood out was the Amritsari macchi with kochujang mayo. With its funky cocktails with a twist and its close to delectable finger food, Vibe has taken social drinking in the NCR to, quite literally, new heights.